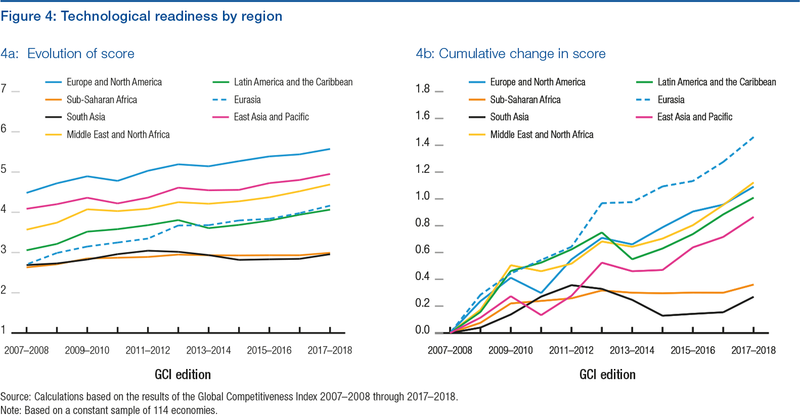 Competitiveness has improved across most countries in South Asia (as seen in Figure 4a and 4b), in particular in the two Himalayan countries of Bhutan (82nd, up 15) and Nepal (88th, up 10). On a similarly positive trend, Pakistan (115th, up seven) and Bangladesh (99th, up seven) have both improved their scores across all pillars of competitiveness. Upgrading ICT infrastructure and increasing ICT use remain among the biggest challenges for the region: over the past decade, South Asia has been the area where technological readiness stagnated the most, with a performance similar to that of sub-Saharan Africa. India (40th) stabilizes this year after its big leap forward of the previous two years. The score improves across most pillars of competitiveness, particularly infrastructure (66th, up two), higher education and training (75th, up six), and technological readiness (107th, up three), reflecting recent public investments in these areas. Performance also improves in ICT indicators, particularly Internet bandwidth per user, mobile phone and broadband subscriptions, and Internet access in schools. The quality of institutions has increased further, especially in terms of efficiency of public spending (20th), but the private sector still considers corruption to be the most problematic factor for doing business in India.